Sounding the Stones. World beat artist James Asher joins forces with Arthur Hull, the celebrated American drum circle facilitator and drummer. Following a visit to the ancient site of Stonehenge, the sense of power and mystery of the stones sparked off their creative music. Sounding the Stones goes beyond your normal drum based music. Harp, keyboards, hammered dulcimer add depth and evoke rewardingly meditative vistas. Sounding the Stones is available in limited edition format with the additonal bonus CD ‘Colour Your Life Collection’, featuring 22 tracks from the Oreade Music label as an introduction to the present day music of healing, mantras and relaxation. Credits : Recorded and produced by James Asher at Starfield Studios. 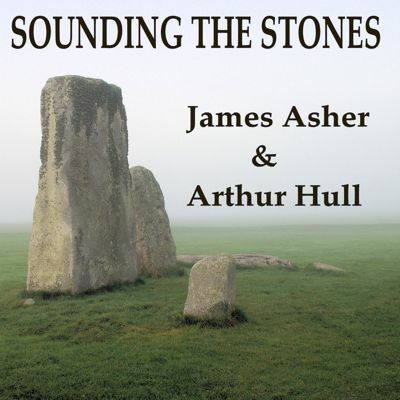 Written by James Asher and Arthur Hull (www.drumcircle.com), except ‘Going for Gumbo’ written by James Asher. Musicians : James Asher – keyboards, bazouki, dulcimer, percussion, programming, Soundscape Red’s. Arthur Hull – ashiko drum, standing ngomo, kalimba, hammered dulcimer, woodblocks, cowbells, shaker, taiko drum, percussion drums. Madeleine Doherty – harp on ‘Going for Gumbo’.